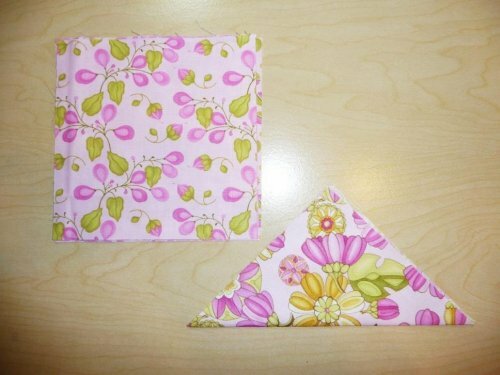 2 – 4” squares of two different greens for leaves. 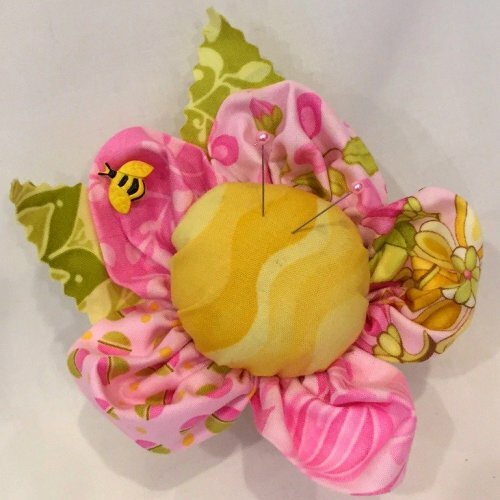 This project was made using Bernina feet and stitches. 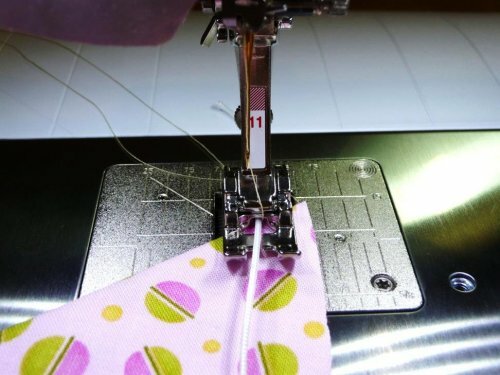 If you have a different brand simply use a similar foot or stitch for your machine. Iron petals in half diagonally. 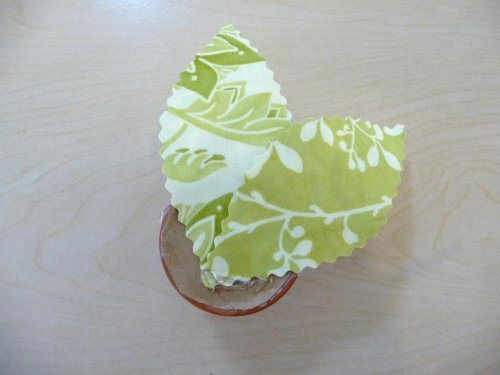 Cut out petal shape by rounding top of folded triangle. Place 1 Yard of cording under #11. Leave a 4” tail of cording behind foot. 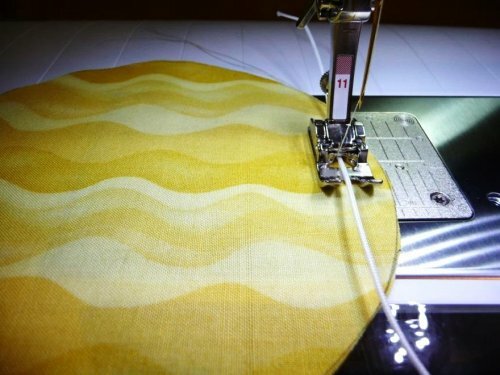 Zig Zag over cording with ½” seam allowance around curved edge. 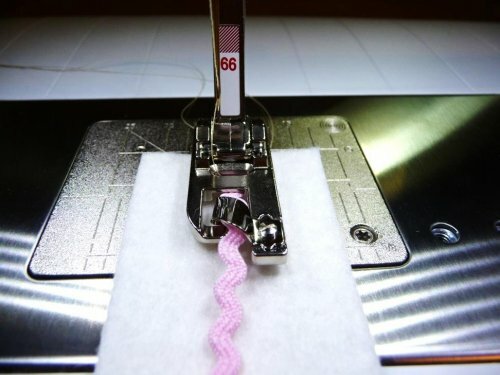 DO NOT SEW THROUGH CORD! 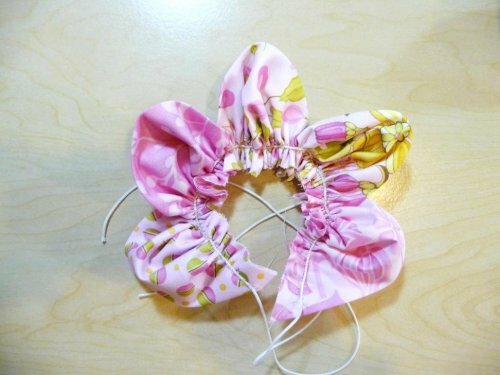 Chain stitch through all five petals. 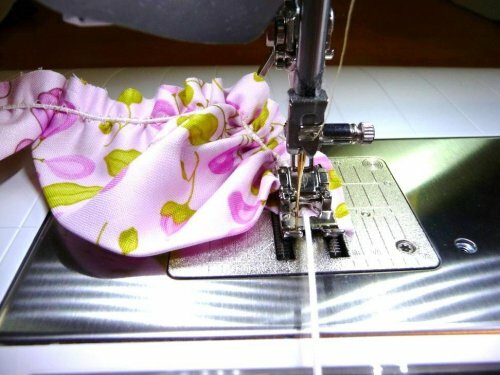 Pull cord as you sew to gather fabric. BE CAREFUL not to pull out of zig zag. Pull cord tight and gather. Clip threads wrapped around cord between petals. DON’T clip cord! Gather as tight as possible and tie cord in a knot. 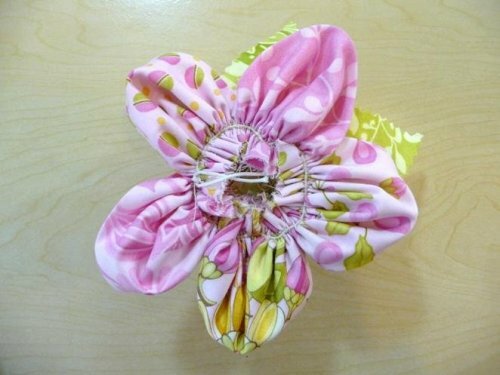 Use circle cutter to cut a 5 ½” circle from flower center fabric. Put pin in middle of template and a fine pen on the 5 ½” line and twirl. 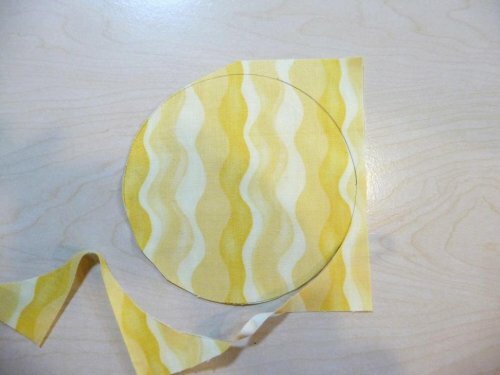 Sew around circle with cord. 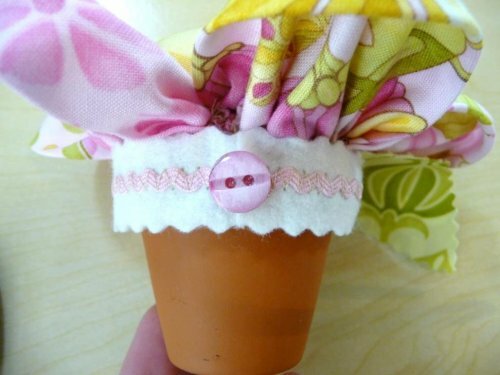 Use same method as with flower petals. 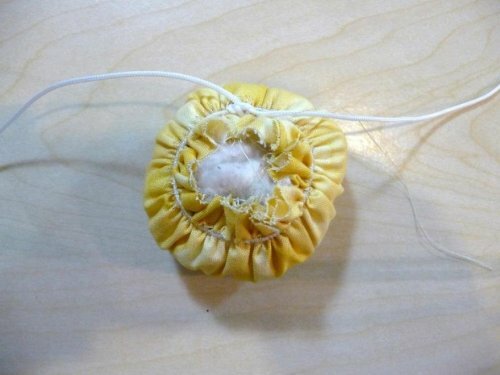 Pull up cord and fill with stuffing or walnut shells. Tie cord in a knot. 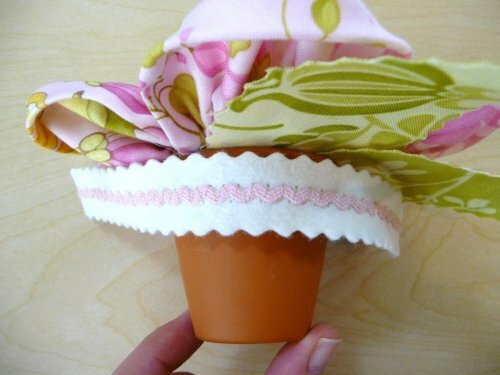 Choose two green fabrics for leaves. Iron Steam a Seam to wrong side of one. 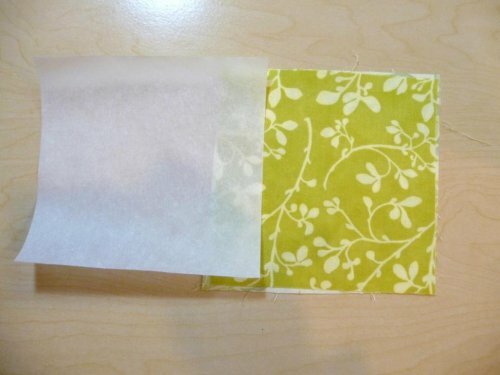 Peel paper off and iron other fabric to other side. 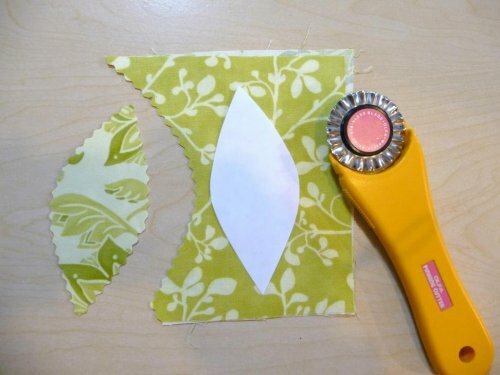 Cut out two leaves from green with pinking blade. Place ric rac in front groove of #66 foot. Sew with zig zag on white felt. 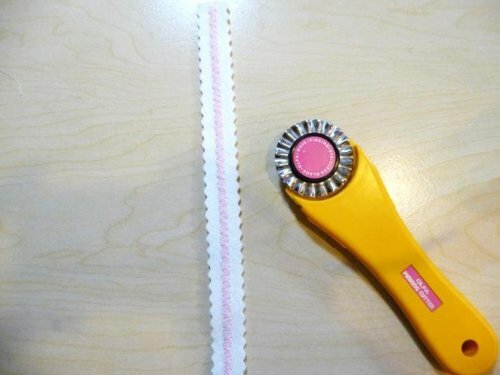 Trim with pinking cutter ¼” on each side of ric rac. 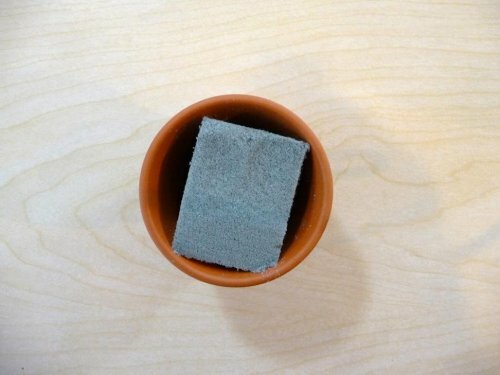 Squish foam into flower pot. 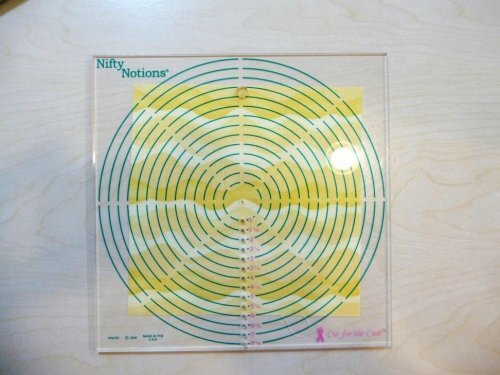 Cut cardboard circle and glue on top of foam. Glue down leaves. Reverse one so it looks like two colors. Make sure all raw edges are tucked under. Place a circle of glue all around top of pot so sticks in place evenly. 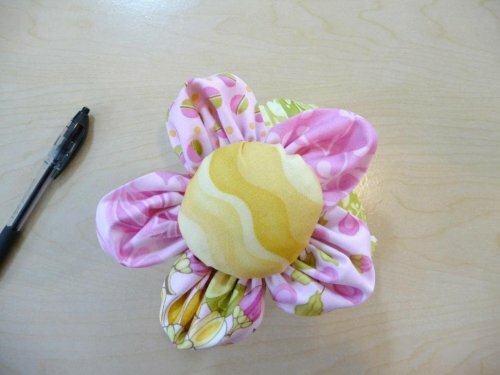 Place a circle of glue around cord of petals, place on top of leaves. Make sure raw edges are hidden and hold in place until adhered. 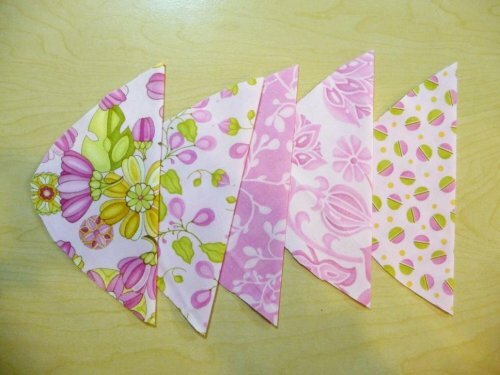 Place close to petals to hide any raw edges or glue. Add a button or two.